Enjoy a meal at the Lake Louise Station Restaurant. The restaurant is housed in the second Lake Louise train station, an original 1908 log building that is atmospheric and charming. The walls are decorated in historic photos that are worth a close look. You can also dine in two historic train cars located behind the station: the Delamere and the Killarney (one time the private car of Lord Shaughnessy, president of the Canadian Pacific). From the Station Restaurant, take a short walk up the Tramline Trail to a large clearing and expansive view of the Bow Valley. The current CPR line will be visible below. The Lake Louise Tramline, a narrow-gauge railway, connected the station to the Chateau on the shore of Lake Louise from 1912 to 1930. Today the abandoned grade is a walking, cycling and cross-country skiing path. Take the #1A Bow Valley Parkway for 5 minutes towards banff and stop at the Outlet Creek parking area. From the road here, you are looking down on Morant’s Curve, a lovely bend in the railway line that CPR photographer Nicholas Morant used to his advantage. This vantage point makes it possible to get more of the train into the picture, and the bend adds a dramatic element to the composition. 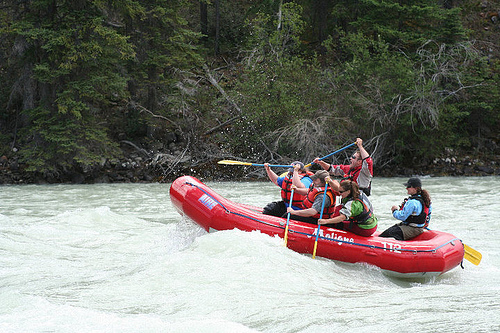 Take the Trans-Canada Highway (#1) west in the direction of Yoho National Park and the town of Field. 10 minutes from Lake Louise the highway crosses the Great Divide and the British Columbia/Alberta border. From here the road follows the original railway grade as it begins to descend “the Big Hill.” In the space of six kilometres (3 3/4 miles), the road will drop 300 metres (almost 1000 feet). Past Wapta Lake, on the left, is a pullout to view an old bridge left over from the original line. 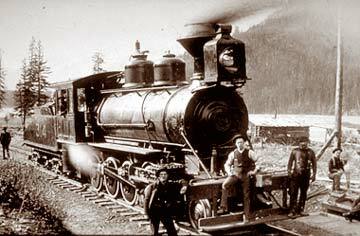 For the first 25 years of the railway’s existence, runaway trains were a real concern. Eventually the CPR dealt with the Big Hill by building two spiral tunnels. A few more minutes down the road is a pullout for the Lower Spiral Tunnel on your right. Exhibits tell the story of the early years and of the construction of these engineering marvels. 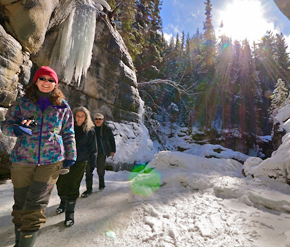 The Upper Spiral Tunnel can be seen from a well-marked viewpoint 5 minutes up the Yoho Valley Road. At the bottom of the Big Hill, turn right onto this road. 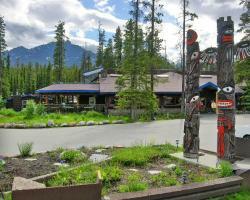 As you return to the Trans-Canada, turn into the Kicking Horse Campground and follow the road to the back end of it. On your right is the trailhead for the Walk in the Past Trail. Pamphlets that outline six stops of interest should be available at the kiosk. The trail is 1.2 km (3/4 mi) long with about 100 m (300 ft) of elevation gain. At the end are the remains of a narrow-gauge locomotive that was used to haul away rubble during the construction of the spiral tunnels. As the Yoho Valley Road rejoins the highway, stop for a moment to admire the small railway tunnels cut into the steep sides of Mt. Stephen and the bulldozer work that allows the line to pass through the runout zone of an avalanche path. The other thing that CPR workers must worry about are the several jokulhlaups that threatens from above. Jokulhlaup is Norwegian for “glacier flood.” A lake that forms underneath a hanging glacier above sometimes discharges, creating debris flows that inundate the tracks below. Drive about ½ kilometre along the highway and pull off again. On the side of Mt. Stephen, the rails pass through a large opening in the trees. In the winter of 1998, a large train lost control on the Big Hill and wrecked itself here, piling up dozens of cars and spilling tons of grain. It was impossible to fully clean up. Spilled grain can attract wildlife and put them at risk of being killed, so CP Rail erected electric fencing around this site. By now you must be hungry again, so it’s time to pull into the town of Field. The town is mostly populated by people who work for the railway and for Parks Canada. Field got its start as Mount Stephen House, one of the many hotels that CP built along the line. It first functioned as a dining stop so that dining cars would not have to be hauled up the Big Hill, but quickly evolved into a hotel that catered to tourists that the CPR attracted to the mountains. 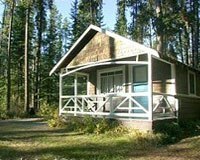 It stood from 1886 to 1953 on the current site of the CPR bunkhouse — your destination for lunch or dinner! Turn off the highway and come into town, cross the river and then cross the tracks. Take the first right turn and make your way down to a beige building. Park and go in the front door — tourists are welcome, despite the lack of sign. The diner-style cafe inside is where the railway guys eat their meals and chat. Consider asking them about the big train wreck mentioned above. If you prefer, there is also the Siding General Store and Cafe in downtown Field. Depending on your schedule, you could continue to drive west on the Trans-Canada Highway, following the line as it heads to Vancouver. The scenery is lovely and the rail line comes into view every once in awhile. The Rocky Mountaineer travels during the daylight hours through the rugged Rocky Mountains.